This week, we celebrate BlogBlast For Peace 2011. The FIFTH ANNIVERSAY of this great event begun by our dear friend MIMI of "Mimi Writes". Ah that FIRST YEAR there were a few hundred tops...we were all unsure where it would go. That Christmas, Mimi asked us to post a Peace Globe to celebrate the holiday and a few more joined in. Then we flew globes in June of 2007 and the word was getting out there. On the First Anniversary the group had grown and Mimi was receiving Globes from other countries, but the cause was still gaining its momentum. Second Anniversary and the world was taking notice. Peace Globes from around the globe were flown in honor of a simple thought - Peace For All. On the Third Anniversary, I celebrated 27 World Championships and a hope for World Peace along with thousands of others...it was now a true movement and that year The Peace Globe Worker Bees were born with a simple purpose to aid anyone who needed assistance in constructing their peace globe. The lack of an art program was no longer an obstacle in joining. 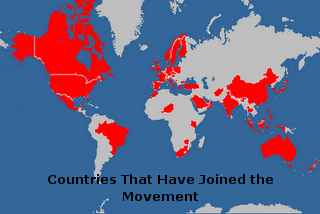 Last year we had covered the globe and the movement took to Facebook and even more people pushed the movement forward. Peace Globes were seen by hundreds of thousands of people. There was coverage on web sites dedicated to Peace in the world and those outside the movement were taking notice. Now, five years after it has begun, there are peace globes from all 50 states, from 55 countries and maybe even more once the sun sets around the world today. 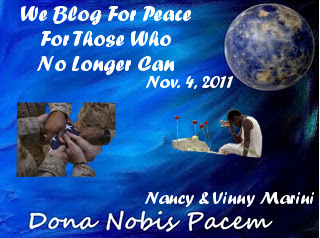 This year, Nancy and I are expressing our hope for Peace for those who no longer can do so. Those who serve our Country and other Countries around the world in the name of Peace who never make it home, those who live in war ravaged countries who have no way to avoid the horrors of war. Those who die of starvation due to the inability to get them the bare essentials needed to live. Keep the movement growing. If you have never Blogged For Peace, think of joining next year. If you know someone in the media, mention this movement to them. Wouldn't it be amazing to see a story on this movement on the news some day? Wouldn't it be even more amazing if we shut the movement down because the world is AT PEACE?!!!!!! Excellent post. May peace reign in your heart on this day and bring a smile to your face. GOod morning dearest Vinny! Shut the movement down? **gasps** Nope...I think at that moment of complete peace we would continue but it would be a blog blast of thanks to the Responsible Person! Love the history of the movement...and I love being a part of it! Nice recap of the years past. Hope you are doing well and that peace finds its way to you and Nancy. Great recap! This is my 4th :) Peace to you today and always! I dream of peace my friend, I hope you find it. I hope that we see a day when we do not have to do Blog Blast for Peace anymore that there will be real peace in our world. Dedicated to those never get a chance...I like that theme. When I remember them, I become even more dedicated to bringing the peace. Nicely done Sir. Peace to you and Nancy and the rest of your family and friends, for today and in all the days to come. Everyone deserves a voice. Thank you for lending yours. I haven't seen peace blogged quite this way today. Thank you for reminding us that there are those who have no voice. I liked the sequential walk down memory lane. You told it well. So helpful for me too! Beautiful peace globe from two beautiful people whom I am proud to call my friends. Love to you both. This came to me in an instant as I sat looking at the template this week. Those who can not ask for Peace any longer. Indeed. We have to hold the standard for all who've lost their way. Peace be with you! Great recap. I find your peace globe very touching. Peace be with you today and every day. Peace to you and Nancy. Beautiful sentiments and tribute, Vinny and Nancy. A wonderful post and a needed reminder of all the silent voices. I combined both Dona Nobis Pacem and 5 on Friday this year. Funny, I remember when Mimi first mentioned the idea of the Peaceglobe, folk just loved the idea...it was an idea waiting for the right person to bring it along...Thank goodness Mimi did! It was a timely beginning, and the core idea has stayed simple, whilst it has spread far!! I am proud to have been in from the beginning (though I missed a year) and even prouder to know, not only the Queen of Bloggingham, but also all the excellent folk I've met on the way round the blogosphere at Blogblast4Peace, and all the other very wonderful worker bees. It has also been a great honour to have known you as long, Vinny. Without you and some others, this might never have got off the ground!